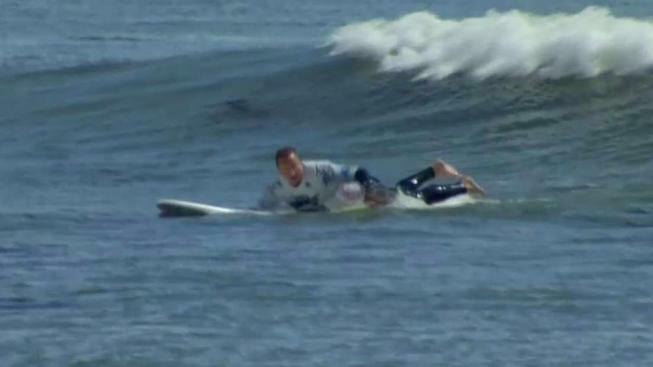 Wounded veterans hit the waves in Santa Cruz this week as part of Operation Surf, an annual event for men and women of the military who were wounded while serving in Iraq or Afghanistan. For many of the participants, it's their first time leaving the hospital since coming home from the Middle East. Volunteers help the wounded veterans learn how to surf, with the hope that the ocean therapy will help them heal one wave at a time. Amazing Surf Adventures founder Van Curaza started the program 10 years ago. "When they come here ... they feel like the world is in control of them," Curaza said. "But when they leave us, they feel like they have control of what's going on in the world." Volunteers use adaptive techniques, so all veterans regardless of disability have a chance to ride the waves. Participants receive food, hotel accommodations, travel assistance, clinical and medical support, and all the resources needed to instill hope and confidence in the water, on the board, and in their daily life, according to ASA's website. It's all funded through generous financial and in-kind contributions from sponsors and donors. The weeklong event runs through Wednesday.